together, in a sense : CHI Gamification: We should know better. CHI Gamification: We should know better. This year, CHI added gamification in the form of “missions” and prizes. Unfortunately, for a community that really ought to know something about good vs. bad gamification, the game implemented turned represented much of the worst of gamification — not just shallow and meaningless, but potentially destructive. Consider the enticement, to the right, which appeared outside of all of the talk rooms. 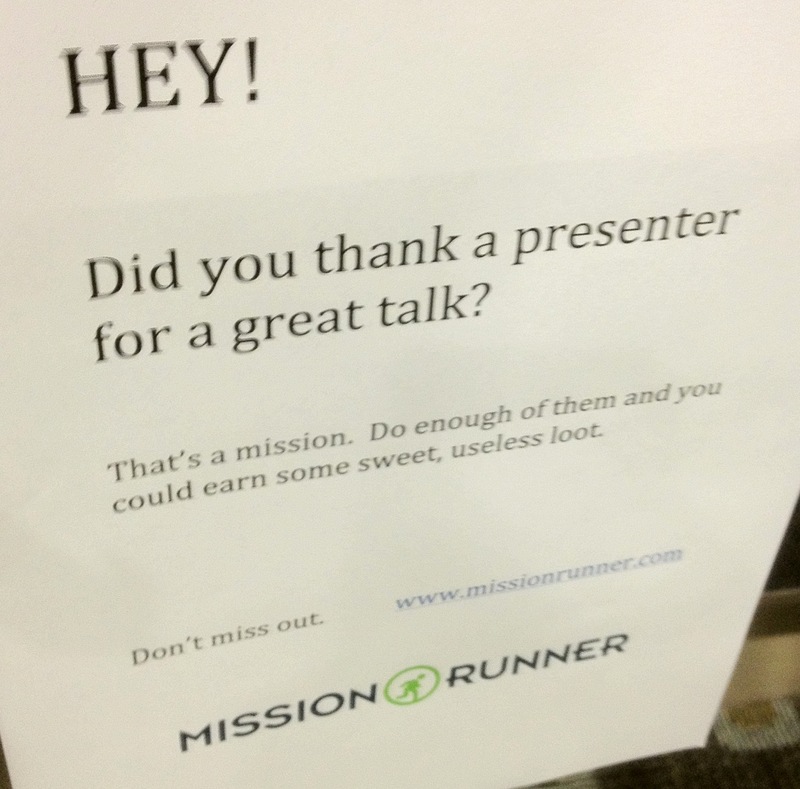 So, once I get past the flyer yelling at me, I learn that I can earn my way toward useless swag by thanking a presenter. There were several like this — thank a committee member member, or “find an entry in a student competition and talk to the students about their experiences” — things that are good to do as a member of the community, and for which there are (or should be) sufficient intrinsic motivators. But now? Now your thanks are just a tool to get stuff for yourself. And as presenter or committee member, you’re left wondering if a thanks is sincere or just because someone needs to check off another badge on their way to status or a chotsky. Sigh. About the only good thing I can say about it is that it didn’t appear to catch on. If you’re organizing CHI 2013 or another conference: please, let’s not have any more of this BS.